Bus box covers for our ABS Regal and Plastic bus boxes. 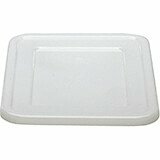 Cover for 15" x 20" Camboxes, Fits Cambro bus boxes model 1520CBP. Poly covers are made of an economical high gloss plastic that provides long service with normal use and care. Its design prevents sticking when nested. Cover for 17" x 22" Camboxes. Fits Cambro bus boxes model 1722CBCW, 1722CBR, 1722CBP. Poly covers are made of an economical high gloss plastic that provides long service with normal use and care. Its design prevents sticking when nested. Cover for 21" x 15" Camboxes. 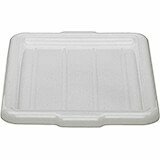 Fits Cambro bus boxes model 21155CBP, 21157CBP. Poly covers are made of an economical high gloss plastic that provides long service with normal use and care. Its design prevents sticking when nested. Cover for 21 x 15" Camboxes. Fits Cambro bus boxes model 21155CBR, 21157CBR. Regal covers are made of a high performance ABS material that is rigid, stain and scratch resistant.